Panoply prom dresses are well known for taking classic styles and silhouettes and putting an edgy twist on them. This collection includes the same bold designs with stylistic flourishes and eccentric flares that you can find on the Panoply dresses official website. Take the same silhouettes that we always love such as the standard a-line dress, princess style ball gown, fit and flare style, and the mermaid fit and combine them with elements such as metallic fabrics, bold prints, multicolored ruffles, and stunning cut outs. The Panoply prom collection redefines glitz and glamour and provides customers with an edgy alternative for their next formal event. You can even find styles that have sequined shorts underneath flowing chiffon. If your style craves a break from the traditional little black dress and you wish to make a fashion statement that will leave everyone talking, this collection is a great place to start your search for the perfect dress. This collection is made with the modern and bold fashionista in mind. Dare to be brilliant in these fabulous styles and we know you won't regret it. There are even styles that would make excellent pageant dresses for Junior and Senior class participants. Wow the judges in a fully sequined beauty or an elegant flowing gown with just the right amount of sparkle and pizzaz. With many color choices to choose from from light blue prom dresses, to black and everything in between, you are sure to find the color that best suits your skin tone and personality. 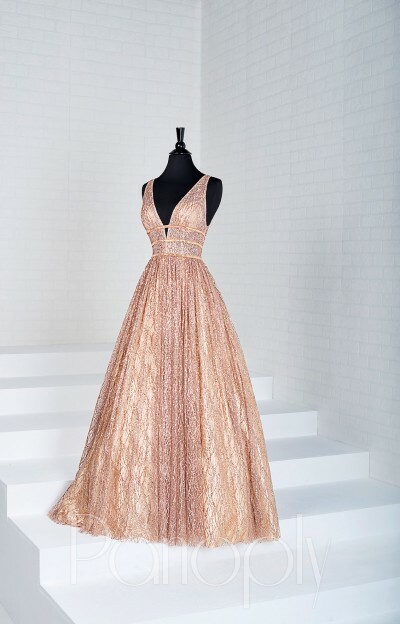 Try a high low dress with straps to show off your fabulous shoes and keep you comfortable all night long, or a two piece number with dazzling beadwork to ensure that you are the star of the show. Don't be afraid to stand out in these incredible designs. These dresses offer a red carpet look with lower necklines, high slit details, a breathtaking open back. With Panoply, you can complete your look by ordering matching gloves for your event. Like many other collections we carry, this line of prom gown options offers different color options for many of their styles. Based on availability, these styles can be ordered in a wide range of sizes as well. Offering sizes 0-30, Panoply makes sure that there is a bold and daring design for girls of all shapes and sizes. We love Panoply for their innovative and daring designs and love to watch our customers fall for them as well. To see similar styles at different lengths and price points, check out our collections of Tiffany Designs, Hannah S, and Studio 17 dresses. See what the hype is about and check out the Panoply styles on sale below to see if the dress you've been dreaming of is here!